A stock Air Power Vector Parts Box that came with a Vector a couple months back. 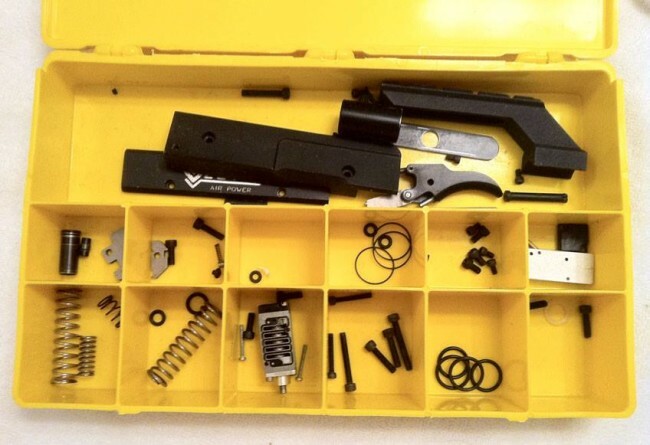 A yellow Air Power parts box for the Vector. The thin orings are the valve body orings which are the most difficult to replace. This kit even includes a few of the very thin orings that go around the valve. These orings typically go bad or are scratched on the removable of the valve body and need to be replaced. Some (Punisher) would cut the valve bodies to take standard tank orings so the thin valve body orings didn’t need to be used. A one handed disassembly of the Air Power Thruster regulator that was offered with the Vector semi automatic paintball gun in the mid 1990s. A fancy semi automatic Punisher Customs Nano Cocker, built off a Sheridan PGP and customized with a Dye swing frame, pnumatics and custom barrel. Air Power produced the Apex Pump in the late 1980s and included this neat patch with their paintgun. A tutorial video showing how to replace the chamber face seal on an old sheridan pgp, pmi 1 or kp2 valve.